Two-step algorithm Classic two-step algorithm – cite! Classic two-step algorithm (message) Classic two-step algorithm – participate! In 2001, the Board of the Consensus Net Meeting agreed on a two-step algorithmThis glossary term has not yet been described. for the classificationis a general process related to categorization, the process in which ideas and objects are recognized, differentiated, and understood. of pigmented lesions of the skin . In the first level of decision making, the observer must decide whether a lesion is of melanocyticThis glossary term has not yet been described. or nonmelanocyticThis glossary term has not yet been described. origin. Once the lesion is identified to be of melanocytic origin, one can move on to level two. This second step the decision must be made if a melanocytic lesion is benignis any condition that is harmless in the long run, suspect, or malignantThis glossary term has not yet been described.. For this purpose, the algorithms found in chapter 9 are most useful. After the initial description of the two-step algorithm, the different types of blood vesselsare the part of the circulatory system, and microcirculation, that transports blood throughout the human bodyThis glossary term has not yet been described. have been described . Since the initial algorithmIn mathematics and computer science, an algorithm (Listeni/ˈælɡərɪðəm/ AL-gə-ri-dhəm) is a self-contained sequence of actions to be performed. Algorithms can perform calculation, data processing and automated reasoning tasks. did not take into consideration the vascular architectureThis glossary term has not yet been described., there was a need to update this algorithm . Search for pigment networkThis glossary term has not yet been described. (N.B: one exception; see below), atypical networkNetwork with increased variability in the color, thickness, and spacing of the lines of the network; asymmetrically distributed; gray color, streakslines radial (always at periphery) streaks Reed nevus melanoma recurrent nevus (i.e., radial streamingRadial linear extensions at the lesion edge and pseudopodsBulbous and often kinked projections seen at the lesion edge, either directly associated with a network or solid tumor border. ), negative networkSerpiginous interconnecting broadened hypopigmented lines that surround elongated and curvilinear globules., aggregated globulesThis glossary term has not yet been described., homogenous blue pigmentation, criteria for melanocytic lesions in special locations such as pseudonetworkA structureless pigment area interrupted by non-pigmented adnexal openings (faceis a central body region of sense and is also very central in the expression of emotion among humans and among numerous other species. ), or parallel pattern (palmsThis glossary term has not yet been described., solesThis glossary term has not yet been described., and mucosa). If any of these structuresThis glossary term has not yet been described. or features are present, the lesion is considered of melanocytic origin and hence, one can proceed directly to the second step of the two-step algorithm. One major exception to the above is when a lesion manifests a delicate peripheral reticulation with a central scar-like area as seen in a dermatofibromaDermatofibromas are hard solitary slow-growing papules (rounded bumps) that may appear in a variety of colours, usually brownish to tan; they are often elevated or pedunculated. A dermatofibroma is associated with the dimple sign; by applying lateral pressure, there is a central depression of the dermatofibroma.. This particular pattern generally trumps the presence of a network, hence preventing the misdiagnosis of a dermatofibroma as a melanocytic lesion. A further clarification of homogenous blue pigmentation as seen in blue neviThis glossary term has not yet been described. is also warranted here. The quintessential characteristic that differentiates a blue nevusis a type of melanocytic nevus that clinically and dermoscopically will appear blue from other lesions possessing a blue-white veil is that in a blue nevus the blue pigmentation occupies the entire surface area of the lesion in a homogenous manner. If the criteria of Level 1 are not met, then one needs to proceed to Level 2. Search for the presence of specific morphologic criteria for basal cell carcinomais the most common skin cancer, and one of the most common cancers in the United States. While BCC has a very low metastatic risk, this tumor can cause significant disfigurement by invading surrounding tissues, which include arborizing blood vesselsanalytic term is branched vessels; Bright red sharply in focus large or thick diameter vessels dividing into smaller vessels; BCC (telangiectasias), leaf-like areasBrown to gray/blue discrete linear or bulbous structures coalescing at a common off center base creating structures that resemble a leaf-like pattern., large blue-gray ovoid nestsclods blue large clustered, multiple blue-gray non-aggregated globules, spoke-wheel-like structures, shiny white areasThis glossary term has not yet been described., or ulceration. In the absence of a pigment networkGrid-like pattern consisting of interconnecting pigmented lines surrounding hypopigmented holes., these criteria are highly suggestive of basal cell carcinoma. If, on the other hand, these structures are not seen, then proceed to Level 3. Look for multiple milia-like cystsThis glossary term has not yet been described., comedo-like openings[[Comedo like openings]], cryptsKeratin filled invaginations that are larger than comedo- like openings Moth eaten border Border with concave or sharp punched-out invaginations, moth-eaten borders, network-like structuresThis glossary term has not yet been described., “fissures and ridgeslines, curved and thick to describe the structural components of the pattern SK” (also known as gyri and sulci) that sometimes give a brain-like or cerebriform appearance to the lesion, fat fingerlike structures, or light brown fingerprint-like structures. Although milia cysts and comedo openings are very easy to identify by standard nonpolarized dermoscopy, they may not be as apparent when viewed using polarized lightThis glossary term has not yet been described. dermoscopy. With that being said, if some of these structures are present, then the lesion is probably a seborrheic keratosisThis glossary term has not yet been described.. The presence of milia like cysts does not automatically equate a diagnosisis the identification of the nature and cause of a certain phenomenon. Diagnosis is used in many different disciplines with variations in the use of logic, analytics, and experience to determine "cause and effect". In systems engineering and computer science, it is typically used to determine the causes of symptoms, mitigations, and solutions of seborrheic keratosis because milia cysts can sometimes be seen in basal cell carcinoma and in melanocytic nevi, especially of the congenital type. Thus, milia cysts should be considered a diagnostic criterion only after insuring that the lesion is not a melanocytic lesion or a basal cell carcinoma. If none of the seborrheic keratosis criteria are seen then one needs to proceed to Level 4. The presence of red, maroon, or red-blue to black lacunaeThis glossary term has not yet been described. (also known as lagoon-like structures), indicates that the lesion is a hemangiomaThis glossary term has not yet been described.This glossary term has not yet been described. or angiokeratomais a benign cutaneous lesion of capillaries, resulting in small marks of red to blue color and characterized by hyperkeratosisThis glossary term has not yet been described.. If none of the morphologic criteria described in the previous levels can be identified, then the lesion does not manifest any obvious features of a melanocytic lesion nor does it manifest any of the features seen in the four common nonmelanocytic tumors. These lesions are usually amelanotic or hypomelanotic. Since blood vessels are often the only “diagnostic criterion” it is important to appreciate both their morphologyThis glossary term has not yet been described. and distribution. Hairpin vesselsThis glossary term has not yet been described. surrounded by a whitish halo are characteristic of keratinizing tumors, such as keratoacanthomas and seborrheic keratosis. Are usually aggregated focally at the periphery of the lesion. They identify the lesion as squamous cell carcinomaThis glossary term has not yet been described.. Besides the morphology and distribution of vessels, the arrangementThis glossary term has not yet been described. of the blood vessels and the color surrounding the vessels can also assist in the diagnosis. Pearls on a stringThis glossary term has not yet been described. The presence of blood vessels arranged like “pearls on a stringThis glossary term has not yet been described.” or in a “serpiginous pattern” is a hallmark of clear cell acanthoma(also known as "Acanthome cellules claires of Degos and Civatte," "Degos acanthoma," and "Pale cell acanthoma") is a benign clinical and histological lesion initially described as neoplastic, which some authors now regard as a reactive dermatosis. It usually presents as a moist solitary firm, brown-red, well-circumscribed, 5 mm to 2 cm nodule or plaque on the lower extremities of middle-aged to elderly individuals The lesion has a crusted, scaly peripheral collarette and vascular puncta on the surface. It is characterized by slow growth, and may persist for years. The clinical differential diagnosis includes: dermatofibroma, inflamed seborrheic keratosis, pyogenic granuloma, basal cell carcinoma, squamous cell carcinoma, verruca vulgaris, psoriatic plaque, and melanoma. The presence of crown vesselsRadial serpentine or arborizing vessels at the periphery of the lesion that radiate towards the center but do not cross the midline of the lesion. sebaceous hyperplasia identifies the lesion as a sebaceous hyperplasiaThis glossary term has not yet been described. or molluscum contagiosumThis glossary term has not yet been described.. The presence of predominantly comma shaped blood vessels is a hallmark of intradermal neviThis glossary term has not yet been described. . The blood vessel morphology encountered in melanomaThis glossary term has not yet been described. includes dotted, linear irregularlinear vessels with multiple bends, atypical hairpin (serpentine) vessel in a pink background, and cork screw or tortuous vessels. If more than one type of vessel morphology is seen within the same lesion, the vascular pattern is termed “polymorphous.” The polymorphous pattern that is most commonly associated with melanoma consists of centrally placed dotted and linear/serpentine vesselslinear irregular vessels with multiple bends. Seen with flat BCC and melanoma . In addition to the blood vessel morphology described above, the presence of multiple shades of pink, also known as milky red areasMilky-white appearance or pinkish structureless areas ("strawberry and ice cream"-like), consisting a red vascular blush with no specific distinguishable vessels, can also be seen in melanoma. The milky red color probably represents an increased vascular volume and may be a reflection of neoangiogenesis . Lesions that do not display any of the structures mentioned in levels 1–6 are considered “structurelessThis glossary term has not yet been described.” and for such lesions one needs to proceed to Level 7. Lesions that fail characterization in levels 1–6 are tumors that are often completely featureless or structureless. However, it is important to highlight that these lesions are not always necessarily structureless. Level 7 is simply the default category that includes all lesions that fail to reveal any specific diagnostic structures to helpRefers to giving assistance or support to others for mutual benefit classify them as melanocytic or as one of the non-melanocytic lesions mentioned in levels 1 to 6 of the twostep algorithm. For example, the presence of fine dotsDots are small, round structures of less than 0.1 mm in diameter that have a red color when corresponding to blood vessels; however, when due to melanin, their color ranges from black, brown, to blue-gray depending on the depth and concentration of the melanin in the skin (Tyndall effect)., pepperingGray dots, blue white veilBlue-white veil is confluent blue pigmentation with an overlying white “ground-glass” haze. In melanoma, the bluewhite veil does not occupy the entire surface area of the lesion, but rather is present as a focal, ill-defined area. Histopathologically, this dermoscopic structure corresponds to an aggregation of heavily pigmented cells (melanocytes and/or melanophages) or melanin in the dermis (blue color) in combination with compact orthokeratosis, crystalline structure, and blotches may be present in these lesions. 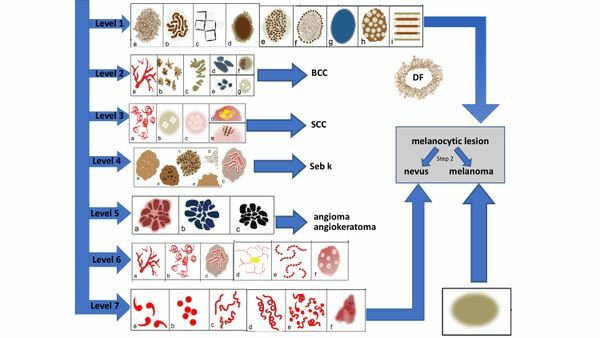 While these structures cannot be used to differentiate melanocytic from non-melanocytic lesions, they can be cluesEvidence, in an investigation that aid in correctly identifying melanomas and some basal cell carcinomas. With that said, for all lesions in level 7 (the so called “structureless” lesions), it is imperative that melanoma be ruled out. This “worst case scenario” avoids missing melanomas that are devoid of any specific discernable structures. Thus, these lesions either should be biopsied or should be subjected to short-term mole monitoringThis glossary term has not yet been described. in an attempt to ascertain their biologic nature. Lesions that are identified as being of melanocytic origin in step one of the two-step algorithm include those described in levels 1, 6, and 7 above. Melanocytic lesions–manifesting structures and features described in these levels can be subjected to the second step of the two-step algorithm. In the second step, the presumed melanocytic neoplasm is evaluated to determine whether the lesion is benign, suspect, or malignant. To accomplish this, many different approaches have been proposed. The main purpose of the two-step algorithm is to avoid missing the diagnosis of melanoma. Although some exceptionsThis glossary term has not yet been described. to the two-step algorithm exist, they do not affect the sensitivityThis glossary term has not yet been described. for melanoma detection. In other words, the two-step process is designed to maximize the sensitivity for melanoma detection . With that said, the main shortcoming of the classic two-step algorithm was that it did not adequately address the evaluation process for amelanotic and hypomelanotic neoplasms. These lesions often appear to be structureless or featureless on initial inspection. However, upon scrutiny many of these neoplasms will in fact reveal blood vessels and are not truly structureless. These new insights prompted us to modify the two-step algorithm by adding two new decision levels to the classic two-step algorithm, which are intended to assist clinicians in correctly classifying some of these so-called featureless neoplasms as either melanocytic or nonmelanocytic tumors. ↑ Argenziano et al. : DermoscopyThe examination of [skin lesions] with a 'dermatoscope'. This traditionally consists of a magnifier (typically x10), a non-polarised light source, a transparent plate and a liquid medium between the instrument and the skin, and allows inspection of skin lesions unobstructed by skin surface reflections. Modern dermatoscopes dispense with the use of liquid medium and instead use polarised light to cancel out skin surface reflections. of pigmented skin lesions: results of a consensus meeting via the Internet. J. Am. Acad. Dermatol. 2003;48:679-93. PMID: 12734496. DOI. ↑ Argenziano et al. : Vascular structuresThis glossary term has not yet been described. in skin tumors: a dermoscopy study. Arch Dermatol 2004;140:1485-9. PMID: 15611426. DOI. ↑ Zalaudek et al. : Dermoscopy of clear-cell acanthoma differs from dermoscopy of psoriasisThis glossary term has not yet been described.. Dermatology (Basel) 2003;207:428; author reply 429. PMID: 14657649. DOI. ↑ 5.05.1 Menzies et al. : Dermoscopic evaluation of amelanotic and hypomelanotic melanomaThis glossary term has not yet been described.. Arch Dermatol 2008;144:1120-7. PMID: 18794455. DOI. ↑ Braun et al. : Pattern analysisThis glossary term has not yet been described. : a two-step procedure for the dermoscopic diagnosis of melanoma. Clin. Dermatol. 2002;20:236-9. PMID: 12074858. ↑ Scope et al. : Nonmelanocytic lesions defying the two-step dermoscopy algorithm. Dermatol Surg 2006;32:1398-406. PMID: 17083595. DOI. This page was last modified on 29 August 2018, at 17:36.